This was the BEST.VONA.EVAR. (I think I say this every year). I can’t even tell you the sense of relief and elation and gratitude I feel. You see, my goal for this revision was to work on characterization. I knew the characters lacked 3D…but I learned what lacked was STORY. Their stories. Ding ding ding! I’ve been writing this thing for nearly 7 years. Not a straight 7 years, as I took a 2 year break from the novel while I recovered from a freaky deaky left thalamic stroke that left me with no short term memory (something, I cruelly discovered, that is critical to writing narrative). But still: 7 years. And I can now see my destination. It’s still a ways off in the distance–and there’s still a lot of work and revision ahead of me–but it’s just work. And more importantly, I am almost done (almost being at least 3 more revisions). Just being able to see the Emerald City on the horizon after all this time on the yellow brick road (or if you prefer another metaphor–the New World after sailing across the ocean)–feels like relief. And hope. And joy. I’ve got my second wind now. And with that second wind, I hope I breath more life and stories into my characters. And that my readers will feel that second wind! Now I’m experiencing re-entry into my world. The last time I had such a hard time re-adjusting was after my three week residency at Hedgebrook. I was changed then, and I am changed now. But nothing else has changed. And no one seems to know I’ve changed. Things feel out of sync. I’m bewildered and bewildering. And so I find myself taking a deep breath. I’m saving that breath for my novel. And in my real life, I am settling back into normal patterns, so that I can fit back into my real life. Immediately upon my return to NYC this weekend, I went to Pride–in my 20+ years in the SF Bay Area, I’d never been to a Pride Parade, for no good reason other than not wanting to deal with traffic, which is like–a really bad reason. So like with yoga, it took NYC to get me to Pride. And what a Pride it was! 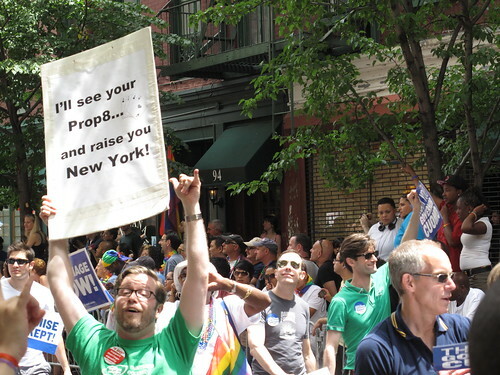 The jubilance in the wake of the passage of NY’s Marriage Equality Law was amazing. I cried tears of joy, and my voice went hoarse along the parade route. But I gotta admit–I think some of those tears of pride were for myself. I’m a self-critical writer, and I rarely feel proud of myself as a writer–but in that moment along the parade route, in the wake of immense writing encouragement and support at VONA, I felt rare pride in my writing. And it took Pride to swallow me up and allow me room for my private moment of pride. I also went to the Alexander McQueen show at the Met yesterday afternoon (like I said, I’m not jumping straight back into my writing–I’ve gotta digest all the epiphanies from last week)–and that show is a masterpiece. All those beautiful, groundbreaking clothes–created from the dark places in McQueen’s heart. It was like a torch for me and my writing. If you are a writer of color serious about your craft and seeking community and mentorship…get thee to VONA. Apply. It happens every summer in the SF Bay Area (this summer, VONA moved to the Berkeley campus). It’s been life changing for me, and game changing for my writing. If you have attended VONA in the past and/or want to support writers of color, consider making a donation to VONA.